Sleep is generally defined as an easily reversible (with strong or meaningful sensory stimuli), temporary, periodic state of suspended behavioral activity, unresponsiveness, and perceptual disengagement from the environment. Sleep should not be considered a state of general unconsciousness. The sleeper is normally unconscious (but not always) of the nature of events in the surrounding environment. However, the sleeper's attention may be fully engaged in experiencing a dream. And if reportability is accepted as a sufficient condition for conscious mental processes, any dream that can be recalled must be considered conscious. Dreaming, then, can be simply defined as the world-modeling constructive process through which people have experiences during sleep, and a dream is just whatever the dreamer experienced while sleeping. In general, biological organisms do not remain long in states of either rest or activity. For example, if a cat's blood sugar level drops below a certain point, the cat is motivated by hunger to venture from its den in search of a meal. After satisfying the urge to eat, the cat is no longer motivated to expend energy tracking down prey; now its biochemical state motivates a return to its den, to digest in peace, conserve energy, and generally engage in restful, regenerative activities, including sleep. This example tracks a cat through one cycle of its basic rest-activity cycle (BRAC). Such cyclic processes are ubiquitous among living systems. Sleep is not a uniform state of passive withdrawal from the world; a version of the BRAC continues during sleep, showing a periodicity of approximately 90 minutes. There are two distinct kinds of sleep: a quiet phase (also known as quiet sleep or QS, slow-wave sleep) and an active phase (also known as active sleep or AS, REM sleep, paradoxical sleep), which are distinguished by many differences in biochemistry, physiology, psychology, and behavior. Recordings of electrical activity changes of the brain (electroencephalogram or EEG), eye movements (electrooculogram or EOG), and chin muscle tone (electromyogram or EMG) are used to define the various stages and substages of sleep. If sleepy enough, most people can fall asleep under almost any condition. After lying in bed for a few minutes in a quiet, dark room, drowsiness usually sets in. The subjective sensation of drowsiness can be objectively indexed by a corresponding change in brain waves (EEG activity): formerly continuous alpha rhythms (see illustration) gradually break up into progressively shorter trains of regular alpha waves and are replaced by low-voltage mixed-frequency EEG activity. When less than half of an epoch [usually the staging epoch is the 20–30 seconds it takes to fill one page of polygraph (sleep recording) paper] is occupied by continuous alpha rhythm, sleep onset is considered to have occurred and stage 1 sleep is scored. At this stage, the EOG usually reveals slowly drifting eye movements (SEMs) and muscle tone might or might not decrease. Awakenings at this point frequently yield reports of hypnagogic (leading into sleep) imagery, which can often be extremely vivid and bizarre. Stage 1 is a very light stage of sleep described by most subjects as “drowsing” or “drifting off to sleep.” Normally, it lasts only a few minutes before further EEG changes occur, defining another sleep stage. It is at this point that startlelike muscle jerks known as hypnic myoclonias or hypnic jerks occasionally briefly interrupt sleep. As the subject descends deeper into sleep, the EEG of stage 2 sleep is marked by the appearance of relatively high-amplitude slow waves called K-complexes as well as 12–14-Hz rhythms called sleep spindles. The EOG would generally indicate little eye movement activity, and the EMG would show somewhat decreased muscle tone. Reports of mental activity from this stage of sleep are likely to be less bizarre and more realistic than those from stage 1. However, light sleepers sometimes report lengthy and vivid dreams upon awakening from stage 2 sleep. 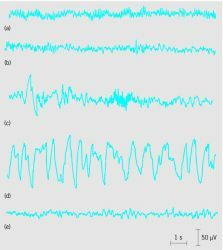 After several minutes in stage 2, high-amplitude slow waves (delta waves) gradually begin to appear in the EEG. When at least 20% of an epoch is occupied by these (1–2-Hz) delta waves, stage 3 is defined. Usually this slow-wave activity continues to increase until it completely dominates the appearance of the EEG. When the proportion of delta EEG activity exceeds 50% of an epoch, the criterion for the deepest stage of sleep, stage 4, is met. During stages 3 and 4, often collectively referred to as delta sleep, the EOG shows few genuine eye movements but is obscured by the high-amplitude delta waves. Muscle tone is normally low, although it can be remarkably high, as when sleepwalking or sleep-talking occurs. Recall of mental activity on arousal from delta sleep is generally very poor and fragmentary and is more thoughtlike than dreamlike. It should be noted that cognitive functioning immediately after abrupt wakening from sleep is likely to carry over some of the characteristics of the preceding sleep state. This phenomenon, known as sleep inertia, can be used as an experimental tool for studying cognition during different stages of sleep. After about 90 minutes, the progression of sleep stages is reversed, back through stage 3 and stage 2 to stage 1 again. But now the EMG shows virtually no activity at all, indicating that muscle tone has reached its lowest possible level, and the EOG discloses the occurrence of rapid eye movements—at first only a few at a time, but later in dramatic profusion. This is REM (or active) sleep. Breathing rate and heart rate become more rapid and irregular, and both males and females show signs of sexual arousal. Brain metabolic rate increases to levels that typically exceed the waking state average. This state of intense brain activation is normally accompanied by experiences that seem vividly real while they last, but often vanish within seconds of waking. When people are abruptly awakened from REM sleep, 80–90% of the time they recall vivid and sometimes extremely detailed dreams. After a REM period lasting perhaps 5 to 15 minutes, a young adult will typically go back through the preceding cycle stages, dreaming vividly three or four more times during the remainder of the night, with two major modifications. First, decreasing amounts of slow-wave EEG activity (stages 3 and 4 or delta sleep) occur in each successive cycle. Later in the night, after perhaps the second or third REM period, no delta sleep appears on the EEG at all, only non-REM, stage-2, and REM sleep. Second, as the night proceeds, successive REM periods tend to increase in length, up to a point. The fact that for humans most REM occurs in the last portion of the sleep cycle as dawn approaches suggests that REM serves a function related to preparation for waking activity. Finally, after four or five periods of dreaming sleep, the sleeper wakes up (for perhaps the tenth time during the night) and gets up for the day. It may be difficult to believe that brief awakenings occur this frequently during an average night; however, they are prompty forgotten. This retrograde amnesia is a normal feature of sleep: information in short-term memory at sleep onset is usually not transferred into more permanent storage. Most organisms are adapted to either the dark or light phase of the day. Therefore, a biological process that limits activity to the phase of the cycle to which the organism is adapted will enhance survival. Most likely sleep developed out of the rest phase of the BRAC, allowing organisms to minimize interactions with the world during the less favorable phase, while engaging in a variety of internal maintenance operations. The fact that different species have many differences in sleep structure, process, and function fits with the idea that sleep serves the specific adaptive needs of each species. Quiet sleep appears to be an older form of sleep with simpler and more universal functions related to energy conservation, growth, and restoration. Active sleep is a mammalian invention with functions that appear to be related to specifically mammalian needs. The portion of total sleep composed of REM is at its highest level perinatally: newborn humans spend 8 hours per day in REM sleep, with even more time during the last 6 weeks before birth. The time of maximal REM corresponds to the time of maximal growth of the brain. A number of theorists suggest that this points to the main evolutionary function of REM: to provide a source of endogenous stimulation supporting the unfolding of genetic programming and self-organization of the brain. The fact that REM time does not decrease to zero after the full development of the nervous system suggests secondary adaptive advantages afforded by REM during adulthood, which may include facilitation of difficult learning and preparation of the brain for optimal functioning on arousal. Although the modern understanding of sleep and dreaming has had the benefit of half a century of scientific research, there are still no simple and conclusive answers to the questions of why we sleep. In The Lucid Dreaming FAST TRACK, readers are educated about the world of sleep and dreaming, and encouraged to remember their dreams in more detail. The university's sleep and dreaming research programme believes people with sleep deprivation are more likely to suffer nightmares. Have Welsh scientists discovered the cause of nightmares? For many years, I've used the Encyclopedia of Sleep and Dreaming as I would any standard reference. More than 200 individual authors, pioneers in sleep and dreaming research, contributed their insights and expertise to the vast 400-topic project. Rotenberg proposes that waking search activity, associated with hippocampal theta, is restored by REM sleep and dreaming. Greenberg & Pearlman similarly argue that REM sleep and dreaming have an information-processing function but do not justify their claim that dreams themselves integrate waking information (and are not merely an index of waking cognition, which would be a more parsimonious explanation of the evidence that they cite). Exactly what the function of REM sleep and dreaming might be remains a matter of dispute, however. His four decades of research have led him to focus on the relative loss of what researchers refer to as: "executive thinking" and "decision making function" during sleep and dreaming. The bizarre experiments are part of Dr Blagrove's in-depth study of the nature of rapid eye movement (REM), sleep and dreaming.